Customer joins Loyalty Club at retailer and receives their card. The customer hands their card to the till operator at the point of sale. The till operator adds up the goods on the till in the normal manner and then swipes the card in our terminal and enters the total amount. Our terminal communicates with our servers, logs the transaction, and returns information back to the terminal screen (all of this is done within four seconds). If the reward threshold has been achieved the terminal will play an audible sound (optional) and display information to the operator of that reward voucher is available. One of the major advantages of the Loyalty Pro system is that the database can return other information to the display screen when a card has been swiped. You can use this feature to validate the identity of the card holder, and/or, to personalise the transaction. This gives you the opportunity to up-sell, and for your operator to personalise the customer experience with somebody they have never met. Hence you can provide the kind of service that people used to get from their local corner shop in the days when the owner knew everybody! If you have chosen the instant printing in-store option the operator asks the customer if they wish to save it for later, or take it away, or use it as part payment for the current purchases. The advantage of this reward method compared to merely having a discount card is that the customer is encouraged to return to the store to spend the voucher, and the instant nature of the voucher becoming available is more powerful and exciting than merely accruing points. Alternatively, the voucher can be emailed directly to their email address as stored on the database. They then print them off at home and bring on their next visit. This avoids the requirement for printers in store. The percentage you give to customers is entirely at your discretion, many of our customers give 5% on a threshold of £100, but you can change either of these values to suit. You can also give different levels of points on different product groups, for example purchase of a sit down meal could have different points to a take-away. We provide a spreadsheet to help potential customers calculate the cost of running the scheme to ensure that the balance is correct on what is given as a reward. The loyalty cards can be designed to use your branding, we use quality materials and professional designers to provide a high quality card which discerning customers would be happy to carry around. Cards can be preloaded with points to in effect turn them into gift cards, you can also have different card designs and reward levels for different customers. For example bronze, gold, platinum. This is a popular option with our retail customers. Once you are up and running our web site can be used to create and send promotions to your clients, either by email or text. You can target clients by specific groups – such as highest spenders, product purchases, or most frequent visitors. Cards can be collected and registered at any outlet in the scheme by use of the registration facility on the tablet. 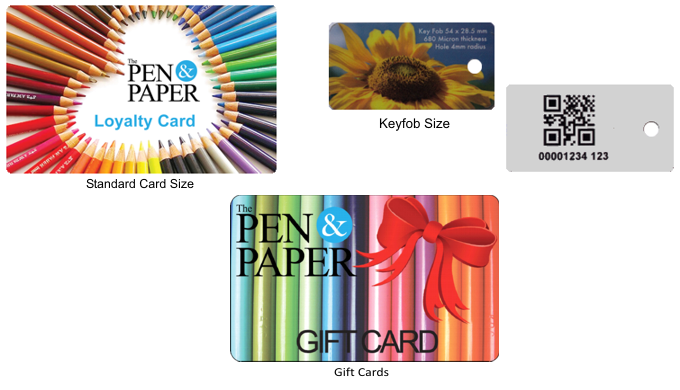 Cards can also be distributed from a central point and registered via the Loyalty Pro internet portal, these portal pages can be linked to an appropriate section of your website if desired, and branded to match the scheme. If you wish the cards to be used to verify identity, the system will allow you to take a passport sized photo at the time of registration which will then be displayed every time the card is used. When a card is registered the new cardholder will receive an automatic email at their nominated email address. 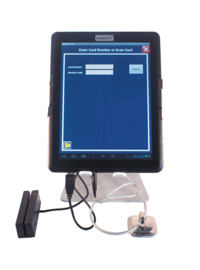 The standard version of Slatepoint comes with a robust metal flip stand with hardware security to prevent opportunist theft.